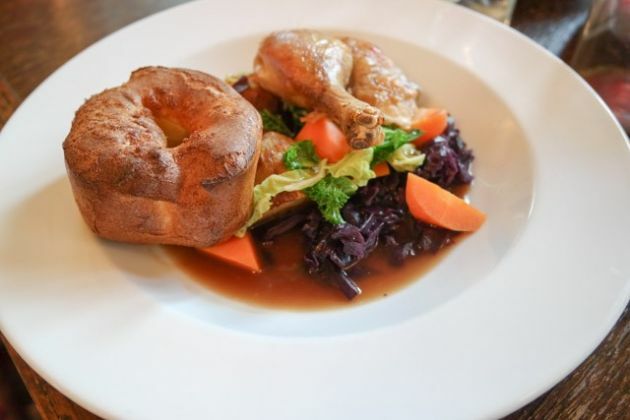 We have visited The Shortlands Tavern previously for drinks and I noticed they also offered Sunday lunch. 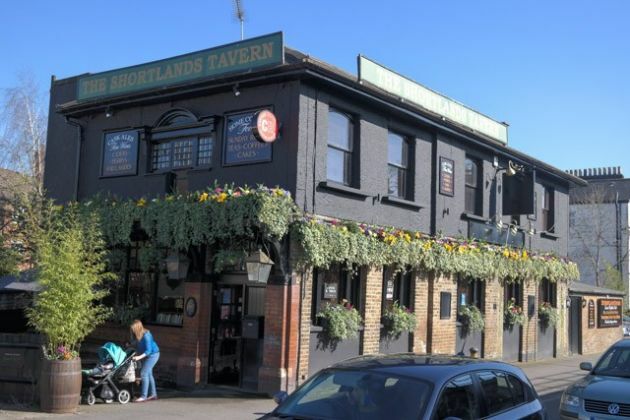 We were at a loose end, so I gave The Shortlands Tavern a call in the morning one Sunday. I was told it was best to book a table as they already had a number of reservations. When we were there, all the tables were reserved, so they weren’t kidding! Outside, The Shortlands Tavern was quite a foreboding pub, with dark painted walls and a large sign. Inside, I felt they were going for an old style country inn, with fussy carpets, animal heads mounted on walls and even a stuffed bird (partridge?) in a glass box! There were a lot of framed pictures dotted around too. It initially seemed quite scruffy, but on closer inspection it actually seemed very well styled (and looked after). I was very much comfortable and at home here. The high chair, which was very clean, for JW was already at our table. Staff were very friendly and attentive throughout the meal, even though it was ‘just’ a pub. We decided against starters, not because of the food options, but because we were so keen to get stuck in to the main! Choices included Chicken Pate, Carrot and Coriander Soup or Prawn Cocktail for £5.95 each, with Confit Chicken Terrine for £6.25. We ordered a child’s Roast Chicken for JW, Claire and I both ordered the Roast Beef. The food came out after a few minutes. JW’s meal consisted of chicken, carrots, red cabbage, green cabbage and a Yorkshire pudding. Claire’s and my plates had 3 large slices of roast beef, cooked medium. We each also had 3 roast potatoes, carrots, red cabbage, green cabbage, al dente carrots and a yorkshire, with lashings of gravy. Although the roast potatoes weren’t crispy (perhaps because they were underneath the rest of the food), they were ok. The rest of the vegetable selection and the yorkshire were nice. 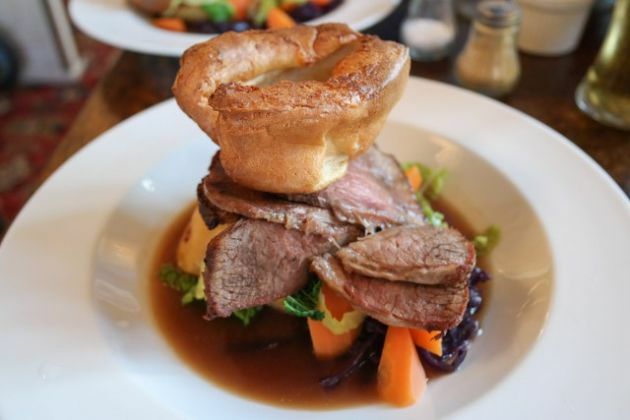 Something I remarked to Claire about was the absence of salt – where most places serve a Sunday lunch with a lot of salt in the gravy, roast potatoes etc, I couldn’t taste any here (a good thing for us – more later). Children’s menu seemed very expensive, £4.75 for strawberry jelly and ice cream or apple crumble. In fact, the adults were also quite high in price, being £6.75 for a chocolate brownie or the crumble. 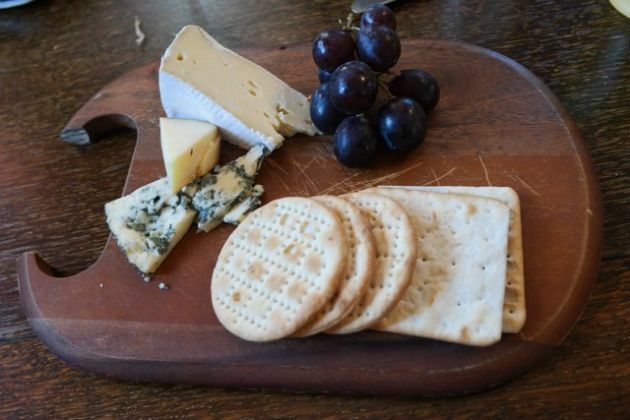 The cheese board was, at £5.95, cheaper than the rest – this is what Claire chose. 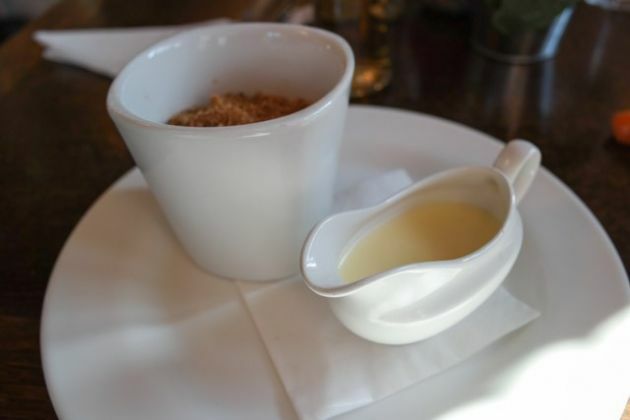 I went for the crumble, which came with custard. JW is too young for desserts, unless they come as part of the menu (which is when I have two!) They were served quickly – I was pleased with mine, the crumble had a nice texture, and I remember there being raisins in with the apple. Claire was in awe of the cheese board, so much for such a low price (compared to everywhere else we have ever visited!). JW loved the grapes. A lot of clean, sturdy high chairs were available, along with a fresh baby changing area (in the disabled toilets). A children’s menu was provided at a fairly reasonable price (apart from the desserts). It would be suitable for more hungrier appetites as well as toddlers. The food didn’t taste salty, so could actually be good for children. Also, I believe they are part of the Breastfeeding Welcome Scheme, so mothers with young babies are also welcome! I really liked the meal at Shortlands Tavern. The staff were friendly and helpful, waiting on us throughout the meal. The lunch itself was nice, perhaps the roast potatoes could have been crunchier (or, just don’t stack the food on top of them!). The venue had good children facilities (I think they are creating a garden area out back). They have various events happening throughout the week / month (knitting club on Monday evenings, anyone?) which adds to the ‘local community pub’ feel. So, a good Sunday lunch at The Shortlands Tavern in Bromley, and somewhere that will be on my regular places to visit.